﻿	Woman in the Middle » A Home Invasion, a Bomb, or…a Closet Rod? A Home Invasion, a Bomb, or…a Closet Rod? We had been in bed about 25 minutes when what sounded like an explosion or, god forbid, someone bursting into our home in a home invasion, suddenly happened. “What was THAT?” I asked. Hubby replied, “I don’t know, but we better find out. ” The noise sounded like it was centered at or above our bedroom door. I crept out of the bedroom and asked Eldest if she heard it, Yes she did. Her assumption was the cats had toppled something over. I opened the garage door and they both gave me a “What the HELL was that?” look, so I figured it wasn’t them. Hubby grabbed a flashlight and started looking around outside and up on the roof. I kept looking at the ceiling, expecting to see cracks or holes or SOMETHING that would explain the big bang followed by what sounded like a spray of glass or ceiling bits. I finally looked in the master bedroom closet and there it was. The clothes rod on my side of the closet had fallen off the wall, yanking the brace out of the wall with it. The sound of things shattering or scattering afterwards was the metal hooks on my hangers hitting each other after the rod fell at an angle. I went outside and told Hubby I had found the problem. He came in, looked at the situation, and told me I had too many clothes. Well, I would like to dispute that. I may have had too many clothes on the rod, but I in no way have too many clothes! FYI, a downward angled clothes rod is not a great plan for clothes storage. They do always happen at night! I think a gremlin went into your closet and sat on it. Are you sure about that? We are our mothers’ daughters – lol. I KNOW I have too many clothes but I would never admit to the hubbins! If you saw the size of our closet you would see it is impossible for me to have too many clothes! 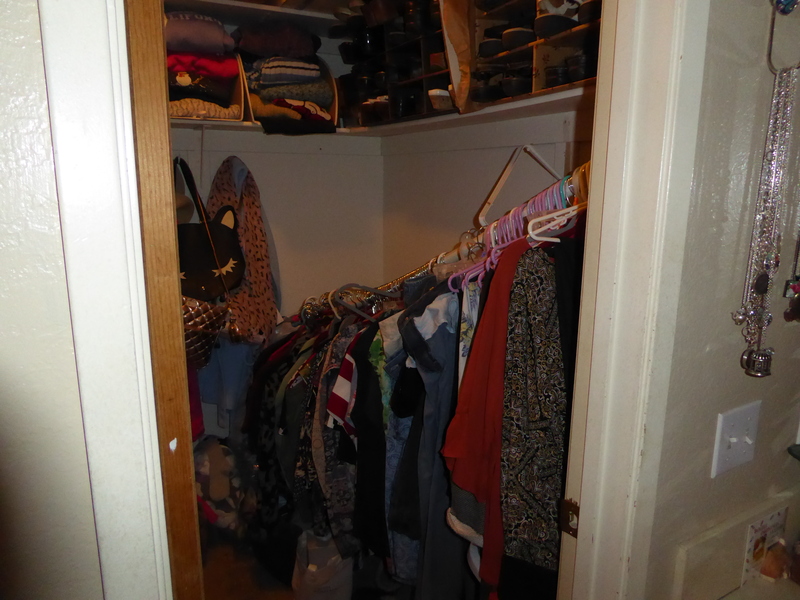 Except for Eldest Daughter’s room, the closets in this house are very small. Howeevr, I do love to shop, and that is in my DNA for sure! BTW, been to Dollar tree lately? Of course. And Goodwill and Salvation Army! You? I am glad it was just the clothes rod. WHEW!